Nearly 150 racers from the Historic Sports Car Club will head to Belgium this weekend (14-16 September) to race at the world-famous Spa-Francorchamps circuit. 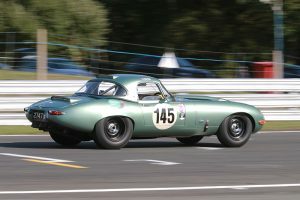 The high-profile Classic Six-Hour weekend features three grids dedicated to HSCC members, with rounds 10 and 11 of the Silverline Formula Junior UK Championship, the final race of 2018 for the Jaguar Classic Challenge and two half-hour HSCC Closed Wheel races for competitors from several of the Club's categories. Nearly 50 Formula Juniors will line up for the UK championship's away weekend and it is defending champion Peter de la Roche who heads the points with his Lola Mk3. As ever, the Cheshire youngster will set the benchmark in class D2, but at the very head of the race will be the rear-engined disc-braked cars of Sam Wilson, James Murray, John Fyda, Goodwood GT race winner Lukas Halusa and Chris Goodwin in a very strong field. Running for an hour on Sunday afternoon is the deciding round of the HSCC-run Jaguar Classic Challenge. Notable contenders for victory include Gary Pearson/Carlos Monteverde, Nick Riley/Ben Short, Marcus Graf von Oeynhausen, Vincent Gaye/Anthony Reid and Martin Stretton/Stefan Ziegler. Chasing class honours after a strong fourth in the Kinrara Trophy at Goodwood will be Chris Milner and Nigel Greensall. The pair of Closed Wheel races offers Club members the chance to race at what many consider to be the best circuit in the world and a mighty entry of 60 cars has been received. The races are for cars from the Pre 80 Endurance, 70s Road Sports, Historic Road Sports, Guards Trophy, Historic Touring Cars and Super Touring categories. Setting the pace will be the stunning Cosworth DFV-powered Lola T282 of Leo Voyazides, one of 16 cars from the Pre 80 Endurance Series. His rivals include Kevin Cooke (March 75S), John Spiers (Osella PA3) and Daryl Taylor (Lola T390). A strong contingent of Road Sports racers are headed by Oulton Park winner John Williams (Porsche 911SC) and Barry Ashdown (Lotus Elan), while Charles Allison (Chevron B8) tops the regular Guards Trophy contenders.